This is a very popular Korean singer, Taeyang, with the song ‘Wedding Dress.’ It is included here as a glimpse into the current life of young modern Koreans, and the influence of Western wedding traditions. The song itself is a poignant look at love. From the olden times, there has been a saying all across Korea that men from the South make the best looking grooms (shin lang) while women from the North make the most beautiful brides (shin pu).Historically, the neighboring countries of Asia, especially China, perceived Korea as a ‘country of courteous people in the East.’ This epithet says something about the Koreans’ traditional esteem for decorum, courtesy and propriety. Indeed, it is certainly true to say that Koreans are known to be very polite and friendly, and their hospitality is internationally acclaimed. We have included many traditions from Korea. Please feel free to contact us with your comments, and any other traditions which you would like us to include. Enjoy reading! Freedom of religion is guaranteed by the Constitution, and many of the world’s major religions are active in Korea. Buddhism, Confucianism, Christianity, and Shamanism are the four major religions of Korea. At one time, matchmakers were used for half of the weddings in Korea. Families would go to a matchmaker and present their young person with their resumes, and ask them to find someone that is compatible in status and earning potential. Koreans keep precise lineage records and these would be listed on the resume. Today, the matchmaker no longer exists, and some marriage arrangements are made through large, online dating services like Duo. Most weddings are Western style and these is no small Korean style wedding prior to the main event. A note about surnames: Family names are limited in Korea and respect for lineage is powerful. There are only about 300 surnames. Families maintain careful records of their ancestry which are important in marriage, school entrance and job applications. Women do not change their surnames after marriage. For over 2,000 years, the traditional Korean costume, the Hanbok, has been worn by men, women and children. 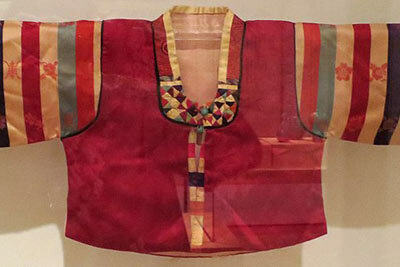 Originally, the Hanbok was made out of white cotton, silk or a scratchy coarse fabric called hemp. Today Koreans wear Hanboks in many colors and types of fabrics. A jacket (chigori) and trousers (paji) and an overcoat (turumagi) are worn. The jacket has loose sleeves, the trousers are roomy and tied with straps at the ankles. A vest may be worn over the shirt. A black hat (moja) could be worn. The wedding feast or reception, (kyorhon p’iroyon) can be a mix of traditional and western cultures. At a traditional wedding feast, you would expect to find bulgolgi (marinated barbeque beef strips), kalbi(marinated short ribs), a variety of kimchee (pickled cabbage with a variety of spices, with other ingredients such as radishes, seafood). There will be many accompanying bowls of sauces for dipping. The meal is always accompanied with a vast quantity of white, sticky rice (pap) as well as kimpap which is rice, egg, spinach and other ingredients rolled in seaweed and sliced into 1-inch rounds. Mandu, a dumpling filled with an egg roll filling – cabbage, carrots, meat, spinach, peanut butter, garlic, onions, deep fried might also be served. Soup will be offered, very frequently a kimchee type, or a rice cake soup (rice dumplings with chicken broth), or Twoenjang guk, a fermented soybean paste soup with clams. Also popular are a light broth boiled from dried anchovies and vegetable soups rendered from dried spinach, sliced radish or dried seaweed. Steamed rice cakes (ttok) sometimes embellished with aromatic mugwort leaves or dusted with toasted soy, barley, or millet flour are presented as tasty ritual food. A large variety of fruits and pastries will be offered for dessert. A spoon and chopsticks are used for eating. In ancient times, the wedding day the weddings were held in the bride’s yard or house. The groom traveled by horse to the bride’s house and after the wedding ceremony took his wife in a palanquin (cart) to his parents’ house to live. The bride and groom wore formal court costumes for the wedding ceremony. Ordinary people were permitted to wear the luxurious clothes only on their wedding day. Hand lanterns are used for lighting the way from the groom’s home to the bride’s home on the night before the wedding. Traditionally, the groom’s family would carry a wedding chest filled with gifts for the bride’s family. Wedding ducks are a symbol for a long and happy marriage. Cranes are a symbol of long life and may be represented on the woman’s sash. In larger cities, luxury hotels will have ‘wedding rooms‘ used specifically for wedding ceremonies. These rooms are decorated with a wedding motif and rented to couples. Today, many couples have a more ‘Westernized’ ceremony with tuxedo attire and white wedding gown. If you are bringing a gift to the wedding, do not expect that the gift will be opened in front of you. The Korean custom is to open gifts in private. Thank you for contacting Korean-Arts. First one must know the type of wedding being given; if it is a tradtional Korean style wedding and most of the guests are Korean then the Korean gift giving system should be employed. If it is an American style wedding and the guests include both Koreans and Americans then American style gifts may be in order. It would be best to check with the bride and groom to see what type of wedding is planned. Most weddings in Korea are Western in the sense that they wear Western clothing and have a Western style service, so the type of wedding is not simply based on the type of clothes worn – traditional Korean clothes (Hanbok) vs Western wedding gowns, but is more determined by wishes of the bride and groom. Korean wedding lists often include hundreds of people that the bride and groom barely know, or don’t know at all because one of the goals is to have as many people there as possible to show the import of the wedding. And this, it seems, works out quite well for the parents who must foot the bill. Wedding gifts usually include an envelope with from $30 to $100 in it from mere acquaintances and the envelopes are checked into the guest register at the front of the wedding hall and given to the parents of the couple after the wedding to help pay for the wedding (weddings in Korea are really expensive). Close friends of the bride and groom, on the other hand, want their money to go directly to the couple and not to the parents so they sometimes give the envelope to the couple surreptitiously. Very close friends may instead give personal gifts like sleepwear or other clothing. 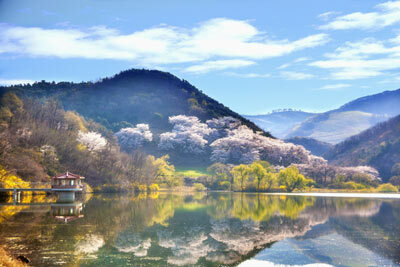 From April to May, when trees are beginning to blossom, young couples are found by Taedong River or Pottongang Hotel. They talk with each other sitting in a bench for hours. Most marriages are for love, but if one of their parents oppose the marriage, they will obey.North Korea is striving to construct utopia by socialistic ways, so the age of marriage is late. The suitable age for marriage is from 28 to 30 for a man, and from 25 to 28 years old for a woman. After the wedding, the couple will go to the statue of the late President Kim Il Sung. The bride’s attire might include a white sash with significant symbols or flowers. A headpiece or crown may also be worn. The norigae is a hanbok decoration which has been worn by all classes of Korean women for centuries. It is tied to the skirt or the ribbon on the jacket. The knot on the top is called the Maedup. Special Thanks to Cher and Marshall Cronican-Walker for their time and energy gathering the majority of information used here.Please note: The information contained in this category should be considered general in nature. We believe it to be true and an accurate representation of some of the customs and traditions for this country. Information provided by individuals and organizations is assumed to be correct. You are welcome to email us at join@weddingdetails.com with any suggestions for changes, additions and deletions. Kut, Korean Shamanist Rituals, by Halla Pai Huhm, published by Hollym International Corporation, 1980. Paper Dolls of Korea, Land of the Morning Calm, by Gloria Larsen 1989. Simple Etiquette in Korea, by O.Young Lee and Seong-Kon Kim, Paul Norbury Publications, Sandgate, Folkestone, Kent England.